Gareth Fuller/PA Archive/PA Images. All rights reserved. A British general election in the next few months became more likely yesterday. Knowing that Theresa May was likely to ask for Brexit to be postponed – as she did this morning – the EU’s chief negotiator, Michel Barnier, said that only something as compelling as a second referendum or a general election could justify a delay. That makes a little-reported trial that concluded in January of critical importance now. Marion Little, an experienced organiser employed directly by the Conservative Party’s central headquarters, was found guilty of breaking electoral law. In a bid to prevent UKIP leader Nigel Farage winning in South Thanet in 2015, Little deliberately exceeded campaign spending limits and created dishonest documents to hide what she had done during the election. She was given a nine-month suspended sentence and fined £5,000. 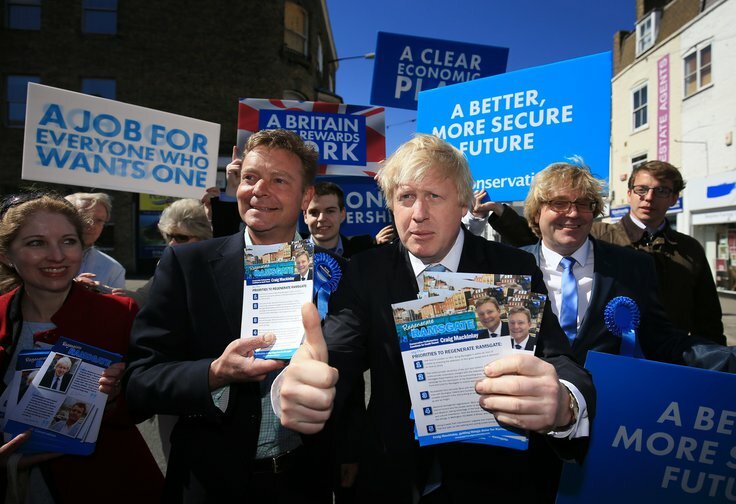 Little effectively ran Tory MP Craig Mackinlay’s winning campaign in South Thanet. (Mackinlay himself was cleared of breaking electoral spending laws.) In his sentencing remarks, Mr Justice Edis said laws relating to elections were there “to protect democracy itself”. But in an uncoded warning to those in the Conservative Party above Marion Little who supervised her work, the judge said that there was “a culture of convenient self-deception and lack of clarity as to what was permissible in law and what was not at Conservative Central Headquarters”. The Conservatives’ declared campaign spending in South Thanet in 2015 came under the £52,000 legal limit for the constituency. But they spent more than double that amount – a further £66,000 – without declaring it, on everything from additional staffing to hotel accommodation and other expenses. Expenditure returns were described in the trial as “woefully incomplete and woefully inaccurate”. What happened in South Thanet has implications far beyond Kent. Looking ahead to Britain’s next vote, whenever it comes, openDemocracy has investigated how local elections are run, and the rules that are supposed to govern them. We’ve looked at a number of closely contested seats, and examined previous spending returns – including, in great detail, those of one marginal London seat. And we’ve examined the powers and governance of the elections watchdog tasked with protecting our democracy. All evidence points to just one outcome: the next House of Commons will contain potentially dozens of MPs who, along with the covert cooperation of their election agents, will have broken the law on campaign spending, and are sitting on the green benches illegitimately. Instead of being disqualified for breaking the criminal law, they will making the law. The report is ‘’probably gathering dust in a bottom drawer and largely unread”, a Law Commission official told openDemocracy. How high up the party supervision chain did knowledge of Marion Little’s activities in South Thanet go? Channel 4 News, whose extensive investigative work broke open the full story and the wider implications of the scandal, was reassured on camera by Andrew Feldman, former Conservative Party co-chair and principal fundraiser, that “everything [in South Thanet] was done properly and in accordance with the law”. That turned out to be far from the truth. In that 2015 general election, Feldman, along with other senior party operatives such as Stephen Gilbert, the former Tory deputy chairman, and Grant Shapps, another former co-chair of the Conservatives, signed off extensive hotel bills for activists involved in the Tories’ controversial national “battle bus” campaign, RoadTrip 2015. The battle bus targeted key marginal seats, using teams of mainly young Tory activists who flooded into dozens of swing-vote locations on a fleet of logo-emblazoned coaches. The aim was to boost local campaigns. The party picked up all hotel and food expenses. The bills were paid through national campaign funds, with nothing declared in official local spending accounts. At the same time, Marion Little was parachuted into South Thanet to help defeat UKIP leader Nigel Farage. A proportion of her party salary should have been declared on the official spending return. It wasn’t. Her stays at an expensive local hotel should also have been declared. Mr Justice Edis said there was a belief at Conservative Party Headquarters (CCHQ) that anyone employed by central office was a central expense, and needn’t be included in a candidate’s election expenditure. So who decides what is listed as a part of ‘national’ campaign spending, and what constitutes the local campaign to elect an MP? The judge said he had heard nothing during the South Thanet trial that suggested those in senior positions above Little had “made any effort” to regulate and distinguish between the two different regimes. Little, the judge said, “was not alone in that she worked in a culture which tolerated some of what she did”. The Law Commission has called for the independent watchdog that oversees elections, the Electoral Commission, to be given far greater powers and authority to police Britain’s elections. The Electoral Commission has frequently supported this call – and the members of its board will play a critical role in achieving and implementing any positive change. A new member was appointed to the Electoral Commission’s board last November. His name is Stephen Gilbert. And he should be very familiar with what happened in South Thanet. Because, in 2015, he was political secretary inside David Cameron’s Downing Street charged with fighting a general election. As the election’s campaign director, it was Gilbert who devised the 40/40 strategy. This focused on holding 40 marginal seats and winning another 40. The priority was early selection of candidates in such seats – South Thanet being one of them – and to install full-time campaign managers, heavily subsidised by Tory CCHQ. This gave central control of what was happening in the seats that would determine the outcome of the coming general election. At the time of his appointment to the Electoral Commission board, Gilbert said he had worked in politics for 30 years, respected elected politicians and said the commission had a “vital role in our democracy”. Some of his colleagues were less flattering. Another former Labour MP, now in the House of Lords, told openDemocracy that Gilbert’s appointment was “so straight out of a 'Yes Minister' script that I could see Sir Humphrey trying to smile and explain”. Nick Timothy was another of the Tory activists who billeted themselves in South Thanet during the 2015 election and whose expenses were not declared in the official local expenditure accounts. At the time, Timothy was a senior aide to then Home Secretary, Theresa May. He would later join May in 10 Downing Street as one of her most trusted advisers. Both he and Fiona Hill were forced to leave Number 10 after May’s disastrous 2017 election campaign. Following discussions with sources in the Conservative, Labour and Liberal Democrat parties, openDemocracy examined the official spending returns in one key London marginal in the 2017 election. We examined all the invoices for printed election material collected in the official declaration of the winning candidate. These were then anonymously discussed with print companies in neighbouring areas with similar retail rents for the exact same products, which included leaflets, posters and cards. On a selection of specific print orders, the difference between the claimed cost of campaign cards, flyers and leaflets and the comparable market rate for the same material was over £5,000. Electoral law says that if a supplier discounts a price by 10% or more below what it would normally charge, or if the difference is more than £50, the campaign must record the commercial rate and not the discounted rate in the expenditure return. If someone had successfully challenged the invoices examined by openDemocracy immediately after the election in question, the difference of £5,000 could have seen the winning candidate kicked out of Parliament and facing criminal sanctions for breaking the legal spending limit – which would constitute electoral fraud. However, with the election now more than a year ago, there can be no formal challenge. In early 2017, the Electoral Commission levied a record fine of £70,000 against the Conservative Party for undeclared or misdeclared spending totalling just under £250,000. As part of a wider investigation into election spending, the Crown Prosecution Service was believed to be considering charges against 30 other people, including 20 sitting MPs. As many as 16 police forces in England were examining evidence. If they had pressed ahead with all of these charges, a swathe of by-elections could have ripped into the numbers on the government benches – threatening the slim working parliamentary majority of just 15 (including Sinn Fein abstentions) that Theresa May had inherited from David Cameron. In the end the CPS, for evidential reasons – and because the time limits to continue with other complex investigations had passed – decided to focus solely on South Thanet. Channel 4 News had also done a lot of the heavy lifting. When Downing Street announced the snap general election of June 2017, it denied there was any connection between the prospect of a swathe of imminent by-elections and the prime minister’s decision to call the vote, something she had consistently denied she would do. In 1946, George Orwell described the English electoral system as “an all but open fraud”. Despite subsequent legislation, our laws are hopelessly opaque, and open to routine and systematic abuse. South Thanet and the fear of a Farage victory meant that Marion Little, according to Mr Justice Edis, was “carried away by her conviction” that defeating the UKIP leader was an “overwhelmingly important political objective”. There are few signs that this culture in Conservative head office has changed.